Of or relating to bionics; having mechanical body parts, or superhuman powers resulting from these. Also in trivial use: powerful, energetic. The study of mechanical systems that function like living organisms or parts of living organisms. Imagine this: a bionic eye that not only gives you perfect human vision, but superhuman vision. It enables its user to see infrared and ultraviolet, has thermal imaging and night-vision, and can switch between telescopic and macro magnification functions. As standard, it interfaces wirelessly, allowing you to surf the internet, make intraocular video calls and utilise a HUD that overlays your vision. It's even possible for two bionic eyes to interface, so that you can literally see the world through someone else's eyes. And as for the Luddites who are already protesting "information overload", it is course fully customisable, allowing you to use as many or as few functions as you desire, or even turning them off altogether. Are you tempted? Come now; you are, right? And if not: how could you not be? It's not so alien. As I sit writing this in a cafe, I'm wearing contact lenses to correct my vision, sitting opposite someone who I'm pretty sure has breast implants. The young man that served me is wearing a hearing aid, and it would be my guess that at least one of the patrons here has a pacemaker fitted. Even those that are wearing glasses - simple, low-tech, commonplace glasses - are integrating their bodies with technology. It's clear that humans seem in no way averse to interfacing themselves with hardware in order to attain some measure of self-improvement. Of course, what I see around me is very different to the theoretical bionic eye I described at the outset, as all of these only serve to correct faulty or deficient body parts. However, the idea that bionics will soon improve upon our inherent abilities is not far fetched, and most such technologies have their inception in advancements made for medical reasons. 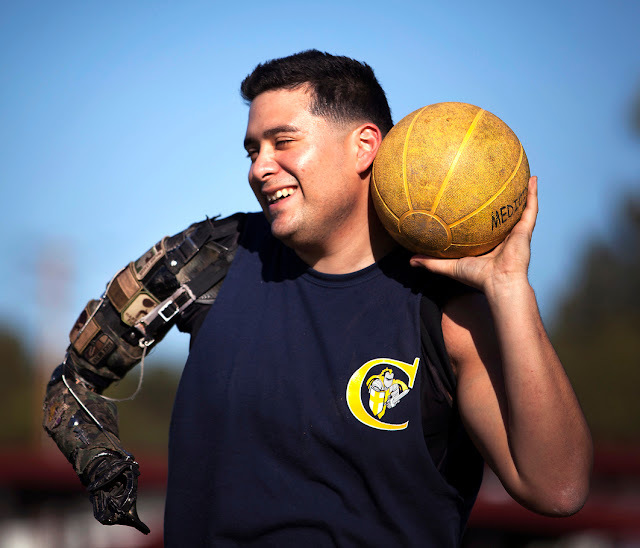 Functioning bionic limbs are already in use, and their proliferation following the horrific injuries in such conflicts as Afghanistan has pushed not only the advancements in technology, but also the urgency of the ethical considerations involved. It's likely that, in the near-future, people will be electing to have healthy limbs removed in order to replace them with supposedly superior bionic ones. Of course, should the day come when we're all sporting so many bionic modifications and improvements that we're more machine than human, we've drifted into an entirely new, transhumanist era. And what if our brains and thought processes are modified by bionics? That would be a very scary development indeed. Do please share this post, and feel free to comment below. And braces! I still have permanent retainers fixed to the back of my teeth. I find all these technologic advances very fascinating. People who would've been confined to a wheelchair, or otherwise unable to do things that are considered "normal", or even just look "normal", have the option to - if they can afford it - adjust their body in a way to make it fully operational (again). I do think it's a very ethical discussion in how far we can take this, though. Removing healthy bodyparts to replace them with artificial ones does seem to go a bit far, but there's a large grey area that just begs to be properly explored. What about the removal of body parts as a precautionary measure, like for example for people with high chances of cancer in a certain part of their body? I agree, Bibi - it's a fascinating subject. I hadn't thought of braces, nor the ethics of preemptively removing risky body parts (something Angelina Jolie has recently brought into the spotlight). You mentioned cost, which would be a *huge* ethical factor if bionics were ever to function better than natural body parts. Presumably such tech would be very expensive, so almost immediately society would develop two classes - those that can afford and therefore have advanced bionics, and those that can't and therefore don't. Crucially, if those with bionics function better than those without (especially if the bionics have extended to enhancing intelligence and cognitive ability), it would quickly become difficult, if not impossible, for those of the "have not" class to challenge the "haves". I was thinking about Angelina Jolie too. It surprised me that it caused such a controverse, when she told the world about the surgery. She had the choice to either live life knowing that she has a high chance at breast cancer, or to go through a procedure that, while physically and emotionally really hard on a person, would relieve her of that fear. Yet somehow, the fact that she made the hard decision to do the latter, was either seen as heroical, or a shame that she took matters into her own hands and didn't rely on the percentage of chance she wouldn't get breast cancer. Neither of those opinions should matter. It's as if there's hardly a middle ground: either people think modern medicine is the end all be all, or people fear the impact it has on our bodies and the way it alters the "natural flow of things". I was surprised at the controversy too, considering the seriousness of the implications. I suppose the ethical problems with regards this and bionics would be if it were felt that some could use a minor deficiency as an excuse to remove otherwise healthy body parts, as in: "I'm a bit short-sighted, so therefore I would like my eyes taken out and bionic ones installed." "It's likely that, in the near-future, people will be electing to have healthy limbs removed in order to replace them with supposedly superior bionic ones." I hope that's something I never get to see, let alone any of the rest. I shudder at the thought! I'm ambivalent about this, Jingles - I really am. My first reaction to the idea is to reject it, but my thoughts aren't consistent. When I think about my eyes (which are moderately faulty, I suppose - I wear glasses and contacts, and have considered corrective surgery in the past), I think I could entertain the thought of having bionic eyes installed, even though the flaws with my own are minor and they're as good as healthy. When I think of my hands, though, as someone that's quite dexterous and good with his hands (I play the piano and type), I can't imagine ever considering the notion of "upgrading" them with bionic models. Bismillah - "In the Name of God"
Bis - French for "Encore"